Sinigang na bangus or milkfish in sour broth is an all time favorite dish of Filipinos. The sour taste of tamarind gives the distinctive taste of the broth. There are many ways of cooking sinigang and ingredients vary depending on the availability of the ingredients. Ingredients like pork, beef, fish or seafoods are used in cooking siningang. You can also use boneless bangus belly in cooking sinigang if you don’t like to eat the fish while removing the spiny fish bones. Cooking this sinigang na bangus is quite easy and requires only a few minutes to cook. If you can cook a simple soup recipe, I’m sure you can cook this dish. The only tricky part is cleaning and slicing the fish since removing the gills and innards requires some experience. But now a days the fish vendor will do the cleaning for you so you can skip that part. And you can also use boneless bangus or bangus belly which I think is easier and more convenient and appetizing to eat. All you have to do is prepare the vegetables and of course extracting the tamarind juice from the tamarind fruit which is also easy to do. 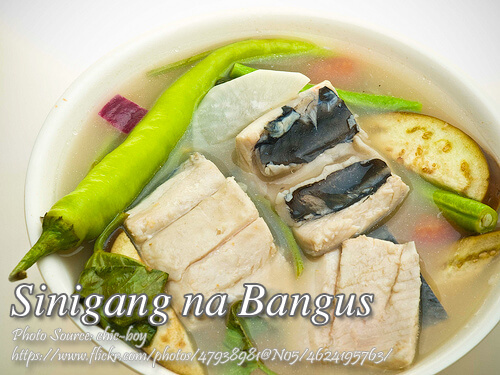 Sinigang na bangus or milkfish in sour broth is an all time favorite dish of Filipinos. Clean and cut bangus into 3 pieces. Sprinkle with salt. In a caserole, put the tomatoes and onions then boil with 4 cups water. Then add the tamarind juice, milk fish, banana blossoms and patis to taste. Simmer for 3 to 5 minutes. Then add the kangkong. Serve. Hi there, can I use instant sinigang mix on this sinigang na bangus recipe? Hi Johnny, yes you can use instant sinigang mix on this sinigang na bangus recipe.